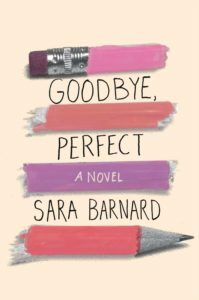 Goodbye Perfect is a story about best friends, secrets, and the pressure to be ‘perfect’. Goodbye Perfect is one of those books that has all these hidden layers. On a story level, Eden finds out that Bonnie is engaged in an underage relationship with their music teacher. But then there’s all these other layers. Like the fact that Eden is adopted and so family is a huge theme in this book. Along those lines, her relationship with her sister functions as a mirror to Bonnie. Her sister has felt the same pressure as Bonnie and that’s part of the root of her and Eden’s issues. And at the heart of this book is a discussion of loyalty, protection, and when you have to betray someone to protect them. Eden is dyslexic and she is biracial Spanish-Caucasian as well. The biggest theme that hit close to home for me was family and Eden’s relationship to her adoptive mother and sister, not to mention her biological sister as well. There are so many added nuances in their relationships. The fact that people look down on Eden because of her status as an adoptee (which was so hard for me to read about). But also her biological sister, Daisy, and how she feels separated from her adoptive family. Eden has all these memories associated with her biological mother, but she also feels like she has to measure up to her older sister, who she thinks is ‘perfect’. And so throughout the course of the book, Eden has to figure out that the people around her, aren’t actually what she thought at all. Eden has to break down her walls to try to see who her older sister is, as well as the relationship she has with her biological mother. In these ways, I actually found myself relating to these aspects of the story more strongly than the plot and the main theme of loyalty. Obviously loyalty and drawing the line is the crux of this book. And I think it’s something we all have struggled with at one point or the other. When do we tell the white lie for our best friend, versus something more. And whereas the people in Eden’s life who have a clear idea of where they stand, Eden feels like Bonnie is owed her loyalty and love. There’s also an element of surprise because Eden counts on Bonnie to ground her, to be the reliable one to her un-moored kite. So this new twist completely destabilizes Eden and their friendship. Something I also liked was this one part of the book where Barnard talks about Bonnie’s privilege. How stark the differences are because of Bonnie’s background, her whiteness, her perfect veneer of academic success. And how different the story would have been if it was Eden. Bonnie is privileged, because she has the world searching for her. Part of this book is looking at the differences in who Eden thought Bonnie was, to her actions today. The feeling that we think we are making a choice, when we have actually been primed. Or when you’re chasing the feeling of satisfaction and fulfillment from school, only to be left at the end of the day with nothing else to satisfy you. Goodbye Perfect is a book about the closest people in our life holding secrets. But it’s also a book about figuring out who we are, our family relationships, and what we are willing to do for our friends. Who are we on the very inside. And what pressures and expectations are we weighing us down. How this level of pressure and expectations are just considered normal without looking at the consequences. Barnard talks in the book about the pressure when we equate academic success with success and happiness. It’s a book about not really knowing people and when we have our own images of them in our head. And so it’s also a book about realizing that there is more to people than meets the eye, that we even think when we know someone. Find Goodbye Perfect on Goodreads, Amazon, Indiebound & The Book Depository. What do you think of the cover? I think it’s really well done to talk about the stress of school, in a very subtle way. I really love books like this that make you think!